This footpath goes around the peninsula on which stands the Fort Carré. His name is sometimes spelled “Fort Quarré” on old documents, also wrongly called “Fort Vauban” or “Fort Reille”, is the landmark of the city of Antibes. The peninsula where it is located was the site of several buildings: a hypothetical Roman temple dedicated to Mercure, a pagan temple, a chapel called St. Michel, a Christian church dedicated to St. Lawrence and built in the fifth century, still existing, forming the central axis of the fort, built the tower of St. Lawrence in 1553. 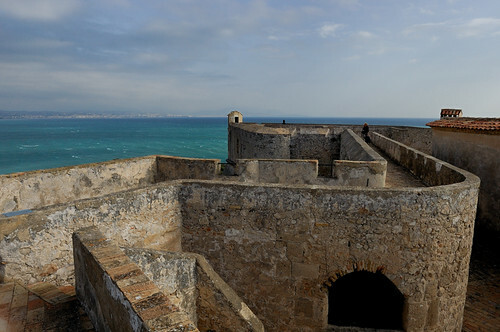 The fort was built gradually by adding to the Tour Saint Laurent a reinforced square structure at its four corners with four triangular bastions called bastion North of Nice, a stronghold of France in the west, Antibes in the south bastion and bastion of Corsica the east. It was completed before 1585, rebuilt under Louis XIII and Louis XIV, by the engineer Niquet according to the plans of Vauban. It housed two large bronze cannons and sixteen iron cannons. It was decommissioned in 1880 as a work in military, but a historical monument in 1938. Restored by the Association du Vieux Manoir, the city made himself owner in 1997. During the last war he was assigned from September to December 1939 for the gathering of German civilians and former Austrian refugees in France, that the Daladier government considered enemies. But the name of Fort Carré is also attached to funny things such as, the film by André Hugon, shot in 1952, entitled “Quatre sergents du Fort Carré”, which tells the story of four cadets from the military academy of Fort Carré who are facing rapt from the girlfriend of one of them and managed thanks to their friendship and courage to find and arrest the bandits. Fort Carré, this is also a place for sport. At the foot of Fort Carré was built the training stadium. It was opened in April 6th, 1920 by the President of the Republic Paul Deschanel, in the presence of the Mayor. In 1932 the company “Antibes-Olympique” bought the frames from the demolition of the grandstands of the Parc des Princes in Paris. With the help of the municipality, they were installed in the stadium, bringing its capacity to 20,000 seats. It was able to host major events, including, June 12th, 1938, a quarter-final match of the World Cup, between Sweden and Cuba, which resulted in the victory of the Swedes on the final score of 8 to 0. This is also where Robert Joanblanq set a new record of France’s triple jump 1st June 1941 by raising it to 14m 32.